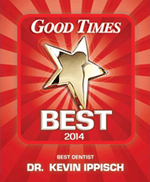 Dr. Ippisch is very experienced and skilled in dental implant restorations. If you’re planning on dental implants to replace missing teeth, give us a call. We have great relationships with many local Oral Surgeons and together we can help achieve a beautiful new smile!